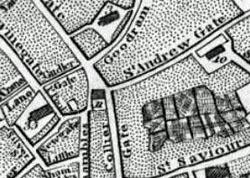 The previous page brought us, via the sinuous curve of cart tracks, to King’s Square, round the edge of the buildings still called King’s Court. Repaving work began this week, in the central part of the square, and the remains of a church have been uncovered. This isn’t surprising, as it was widely known that until the 1930s there was a church here, as previously mentioned in these pages. Holy Trinity, King’s Court, also known as Christ Church. An illustration by Edward Brown, dating from around 1862, of the church before its 19th century restoration. 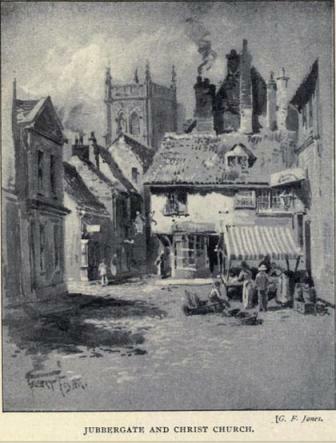 From the Petergate end of King’s Square. By this time the church had already been reduced in size a couple of times (see notes below). 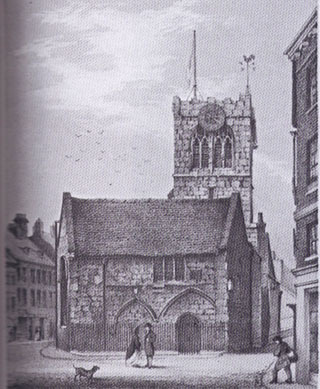 ‘The ditch, on one side of this church, is yet visible, and still retains the name of The King’s Ditch … Previous to the extension of the area for the Hay-Market, this church was much larger than at present; it however retains an appearance of antiquity, which is not surpassed by any other building in the city. The entrance to it, is by a descent of six steps on one side, and three on the other. The floor is extremely uneven, and the whole interior exhibits the stamp of age, and the devastations of time. Visions for the city’s improvement aren’t just a 21st century thing. This 19th century illustration by G F Jones shows its tower over the rooftops of Jubbergate (from what is now Newgate Market, where the stalls are near the Parliament St entrance). ‘Holy Trinity King’s Court otherwise Christ Church is in an unsanitary condition and dangerous to the health of a congregation assembled there and also that the same church is owing to defective construction ill-adapted to public worship’. 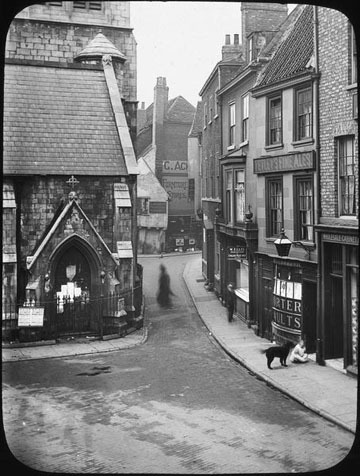 ‘the little grey building which made delightful the junction of Shambles and Colliergate, now reduced to the ideal municipalised stretch of clean pavement with seats for pensioners’. Creating, of course, that space we who were born later have come to love as King’s Square. With its new history, as a meeting place and performance space, and its markers of lives lived since, its commemorative benches and mulberry tree. Soon to change significantly, again. And now, after spending so much money on very little, it is no better than a car park. I have even been tooted at by a driver because I was standing on the footpath where she wanted to park. Absolutely criminal. I cannot understand the demolishing of historical buildings for no reason apart – creating barren spaces or worse 1950’s-70’s ugly buildings. 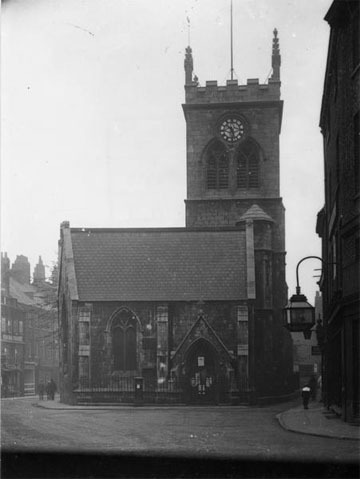 Parish registers for this church are being transcribed and will be available at Freereg.co.uk. Dates 1616 – mid 19th century.